Balcony [Samman Burj] in the palace, Agra Fort. bl.uk > Online Gallery Home	> Online exhibitions	> Asia, Pacific and Africa Collections	> Balcony [Samman Burj] in the palace, Agra Fort. 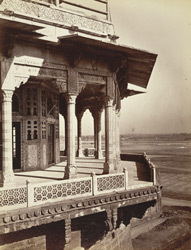 Photograph showing the Samman Burj balcony at Agra Fort, taken by John Edward Saché in the 1880s, part of the Bellew Collection of Architectural Views. Built by the Emperor Akbar (ruled 1556-1605) between 1565-79, the great red sandstone fort at Agra dominates a bend in the Yamuna river. It is a strong military edifice which is also embellished with fine architecture. Beautiful pavilions and balconies grace terraces overlooking the river. The Mussaman or Samman Burj, built in 1628-30 is an octagonal white marble pavilion on top of the highest of the fort's bastions, which is legendary as the place where supposedly Shah Jahan caught a glimpse of the Taj Mahal before he died. Agra, known to have had a fort since at least the 11th century, rose to prominence in the early 16th century under the Afghan Lodi dynasty of Delhi. It became the Mughal capital in 1526 when Babar (ruled 1526-30) defeated Ibrahim Lodi (ruled 1517-26). The capital later shifted to Delhi under Shah Jahan (ruled 1628-58), who gave Agra its most famous monument, the Taj Mahal.